I finished my 1940 Simplicity 3529 jacket as part of the Sewing through the Decades and Sew Weekly challenges and I absolutely love it!! It matches the cute little tilt hat I got this summer in Washington from Urban Eccentric Vintage. You may remember this hat when I wore it with my 1940's ruffled dickey/blouse. In these photos, I've paired the jacket with my 1940 McCall dress (#3638) and my lovely Ness bag (which I made a matching belt for the dress). Can you see the beautiful start to the sunset in the photo below? Nevermind that it's 4pm!! Oh, I can't wait until spring!! Here's a back view. I love that the bagged lining method because it gives a very easy finish to the entire jacket! YAY! I am super happy with the jacket! It will be the perfect topper for dressing up some of the dresses I plan to make! I think I might also have enough faux fur leftover for a muff! I love it!!! Great little jacket. I like the whole outfit. Well done. I must say, you always show all your pieces off in the most amazing pictures. I really need to talk my husband into a trip to Scotland some time. I have never been and looking at your pictures makes me want to go NOW!! You look gorgeous, and your pictures just get better and better! 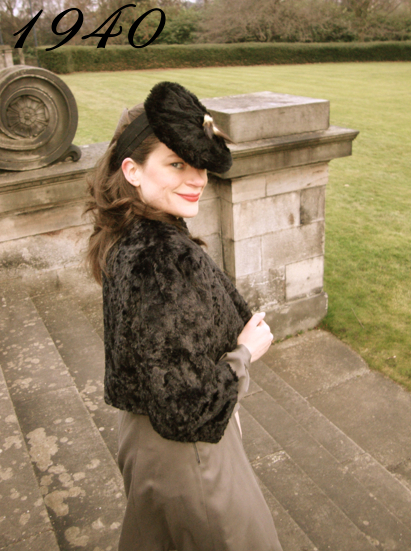 The jacket looks great, and I think the shape and length looks very good on you - and perfect with your vintage dresses. Very pretty! The B&Ws are such pretty photos with a little "is it 1940's or isn't it?" touch. Absolutely beautiful Debi and it will perfectly complement all your other hand sewn clothes. x PS. A matching muff would be fab. Oh.My.Goodness. Gorgeous!!! I just love how the jacket turned out--it looks so smart and you look like you literally stepped out of an old snapshot. So envious! lol. You look fantastic! I love that you've been inspired to work with different fabrics, and that you jumped into faux fur without much trepidation. I'm so proud of you and what you've been able to accomplish in such a short span of time. Lovely, elegant - perfect, seemingly simple pattern to show off the lovely fabric! Looks so cozy! And your photos are awesome! Does your hubby take them? It looks great! The whole outfit does really. Amazing! And with the whole outfit, just stunning! LOVE!!!! This look is perfect! Yay! Great ensemble - very inspiring for a short fur(or faux) jacket. Go for the muff! that's the time specific accessory. And, did I see GREEN in that one photograph? OMG - there is someplace in the world not covered with slush, ice and snow? But Edinburgh is always warmer. I think you might have read my mind Debi, I was just popping by to say if you have left over fur, I have found a pattern for you on Etsy. Initially it reminded me of the long coat on the pattern you used for your fur, and then I noticed the muff and thought that would be perfect for you. You're already ahead of me! This is amazing! All of the things you have been making lately are so great! I am jealous of your sewing dedication! Debi, each item you make surpasses the one before it...even though each time it seems like an impossible thing to do. Love this jacket, I would definitely wear it every day! It matches that hat perfectly! You look so glamorous. But what is a bagged lining? Last year I swore I'd never touch faux fur again after a very hairy and messy disaster that landed in the garbage. But your good description of the sewing process and this ultra-cute jacket makes me reconsider. The pattern you used was designed for fur, right? I wonder if it would be any larger than a pattern for, say, wool in the same size. I think it is goegous and suits you really well! brilliant, gorgeous, fabulous! You are my hero(ine) you stylish dame, you! I've been wearing my 30s persian lamb jacket to bits. My favourite way to add glamour and style to a winter look. Oh so very lovely! You look exactly like a movie star ! Wow! The jacket is fabulous, and never mind that I thought you had purchased it! :p Very spiffy and elegant. Just wonderful!! You will get so much use out of it. Grogeous!!! I can't believe that your hat and jacket didn't come as a set that you bought! They look so perfect together and you look amazing in them. Well done!!! I wish I had a jacket just like this!